Pop up tent is the style of tent that requires no pitching or set up beforehand in order to use it. All you have to do is to take the tent out of its container then everything is ready. As a result, pop up tent is a great idea for shelter if you want to keep your load light and compact. In the case you are intending to buy the best pop up tent available, this article would be helpful. It will give you a quick overview of the tent operation along with excellent products to consider. Take a look at them to see if you can find the best pop up tent to use on the upcoming trip. The reason why this is called a pop-up tent is that it has internal spring loaded poles which made of the frame. When packed, the springs tension is kept in check but if you let the tent into the open, the frame will “pop up”. This means the tent body can take shape the moment you pull it from the bag without any form of preparation. Most of the tent in the category behaves pretty much like this though the packing procedures could be different. 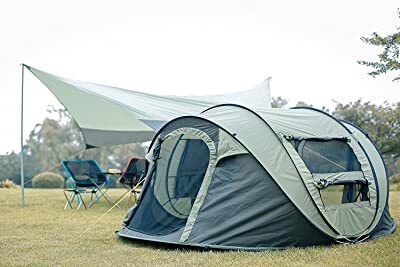 Generally, the pop-up tent is a lightweight option for a place to rest and sleep which is greatly appreciated by ultralight campers. Coleman is a well-known name when it comes to camping supplies and here is one of its great products. This pop-up tent can conveniently support two camping pads with no issue. Its mesh design permits sufficient ventilation for the tent while keeping insects from disturbing the occupants at the same time. The tent is able to endure the average weather so your comfort won’t be affected by the weather too much. One minor problem is rainwater can leak inside if you open the door when the tarp is still wet. The presence of the taped floor-seams is effective at helping you to stay dry and shields the tent from moisture accumulation. You are also provided with two storage pockets to organize your items. Thanks to the multi-position rainfly, the tent ventilation and balance are guaranteed. Couple with high-quality material, the tent remains steady under heavy wind without moving or breaking apart. Its folding technique could be a bit tricky to do at first but you would get used to it after several tries. The floor appears to be a bit thin to some people. Quick setup time, comfortable and generous space, this is what you want on a camping trip. 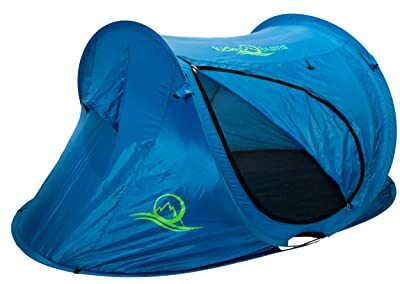 Stay true to the pop-up name, simply take this tent out of the container then it will automatically spring up in mere seconds. No more complicated manual or struggle around the poles, you shall have a stress free experience on the road. 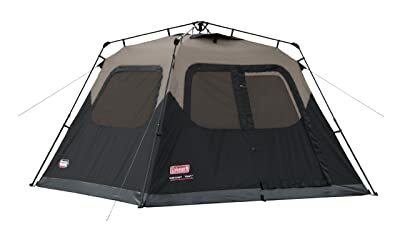 There are mesh windows on the left and right of the tent for ventilation. If you want privacy, a solid nylon tab can be used to cover the window. This lets the fresh air to come in while keeping uninvited guest like insects out. The tent comes with its own carrying bag so you can transports everything around with ease. 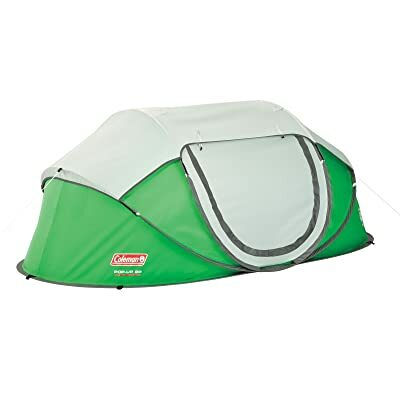 It utilizes PU-coated polyester so the tent is resistance toward UV ray and rain. Several convenient features are available such as a hang loop and storage pockets to accommodate your items. These details are more or less raise the price of the tent which is the main drawback. It will be a costly purchase which you may ill afford is you are shopping on a budget. In a compact dimension, the Survival Hax provides its user with a high level of comfort and safety. When you want to deploy the tent, just undo the strap, drop it on the ground to let the poles do their job. After that, expand the poles a bit then stake them to the ground and it’s good to go. 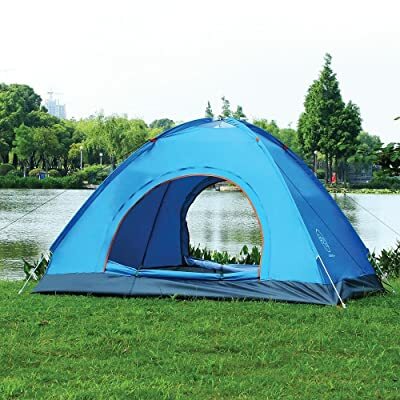 With two doors, the tent is well ventilated which keep the air bearable at al time, especially if the weather is hot. The tent mostly uses 170T Taffeta for the material with the exception of the bottom that is made from 190D Oxford. The capacity of the tent is respectable given it limited profile. But it did get a bit tight when you squeeze four people which could be OK if the tent is used by a family. Otherwise, it’s best to maintain the tent capacity of three adults or less. 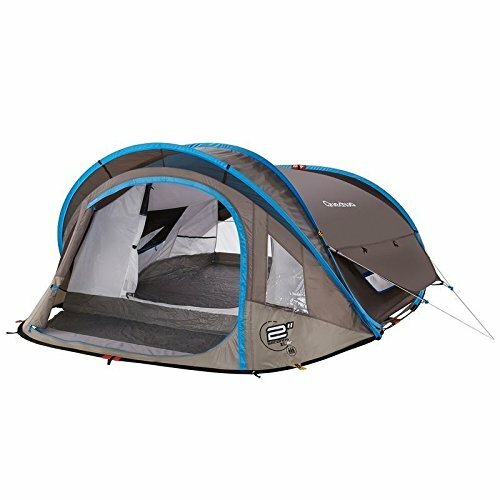 At a rather reasonable price, this is the tent to go for after should you have a tight wallet. It’s not the best but it’s one of the most cost-effective products you can obtain. The tent material and its construction are enough to pull you through a usual camping trip without letting you down. Whether it’s backyard camping or a trip to the beach, this product from Winterial will serve you well. Its dimension is comfortable for two people use which can be packed down for simple carry. Using 190T polyester fabric, the tent holds together very well under the usual conditions. With two windows and one big door with screen, ventilation and accessibility are quite decent in most of the case. Since the poles are made from fiberglass, couple with the hooks, the tent is effectively secured to the ground. Its stability is also great. While the tent is only for two people, its interior space remains adequate so you won’t feel tight or hard to breathe. In the packed form, the tent will fit into a round carry bag with a diameter of 25 Inches. The bag got shoulder straps on its body which let you transport the tent around with no problem. 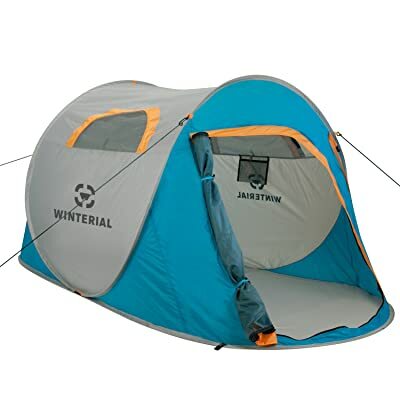 However, you should only use the Winterial tent in clear weathers. While the material is water resistant, it’s not waterproof. In heavy rain, the water would not get through the seams but the wall could be damped. For small party camping, theNorthblu tent is a quality product with great value and competitive performance. It completely eliminated the tenuous task of setting up the tent that makes it a good buy. There is no need to use ground tarps, you can put it down in a blink of an eye as well. The tent entrance has mosquito nets which offer appropriate air circulation without letting insects come in. When it comes to endurance, you may use this under light rain but it can’t handle anything more than that. The price of the tent is acceptable given its features and effectiveness. You won’t use it for sophisticated trips anytime soon but if used correctly, this is fine for a place to spend the night. The tent fits nicely into a 30 Inches diameter container so transportation is not a big deal. If you want something that can withstand the weather a bit, you would be pleased with this tent right here. It works perfectly when the wind speed reaches 50km/h along with 200 mm/h/sqm rain. The tent also provides its users with protection from the harmful UV ray. For the interior, three people can sleep conveniently inside without feeling tight or cramp. The space between the sleeping area and the door could be used to store your shoe, clothes and alike. Come in four colors, this is a good design if you want something for your children to play with. It’s light enough to be carried by kids with ease and the setup is straightforward. 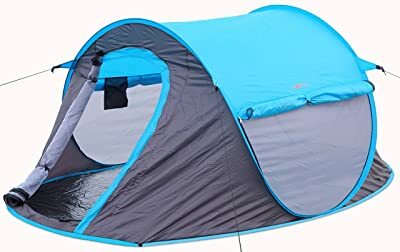 The tent is a great solution if the parents want privacy on a family camping trip with the kids sleeping in a separate tent. Generally, the tent should be easy to handle and manipulate by your little campers. Your children would love to have their own tent to sleep in. And that are some of the best pop up tent you can find around, anything catches your eyes? It’s hard to make a good decision when you know little about available options and their characteristics. But with the help of the information, you should have a pretty good idea about a suitable product. As long as you can ensure the purchase can match your preferences, it will be a wise investment.